Explore, Learn, Have Fun! 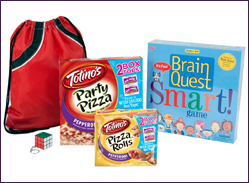 : Totino's Learn a Ton When School is Fun Sweepstakes & Giveaway!! Totino's Learn a Ton When School is Fun Sweepstakes & Giveaway!! Are y'all familiar with the Box Tops for Education Program? We collect those little squares from products we buy and also friends and family who save them for us all year long, then turn them in to D's school to help them buy things they need. So far, that includes playground equipment, computers equipment and more. It's an easy way for families to help their schools raise money. Buy products with Boxtops on them, send them in to school and presto! They get 10 cents per Boxtop collected! And believe me, they add up quickly! This school year, four participating schools in the Box Tops for Education (BTFE) program will each win 250,000 Bonus Box Tops, equivalent to $25,000, from Totino´s to help fund a fun project at their school. View official sweepstakes rules here. You can start, or continue to earn cash for your kid´s school by collecting Box Tops coupons from hundreds of products, including Totino´s! This back-to-school season, Totino´s® Party Pizza® and Pizza Rolls® Snacks will feature double Box Tops on select varieties to help you earn even more for your kid´s school! Fun is an essential part of learning. In fact, there´s a special connection between having fun in school and academic performance. According to a recent survey, 93% of parents believe their kids perform better when having fun during the school day. Continue to help make your kid´s learning environment more fun and exciting by taking advantage of these simple opportunities from Totino´s - enter the "Learn a Ton when School is Fun" sweepstakes for your chance to win 250,000 Bonus Box Tops. Serve up a quick and delicious after-school snack with Totino´s Party Pizza and Pizza Rolls Snacks, while collecting double Box Tops from each. You can also check out these videos from a group of Totino´s Fun-Atics, Box Tops Coordinators who are bringing fun to their local schools. Three Coupons: one each for a free package of Totino´s Pizza Rolls Snacks, Totino´s Party Pizza and new Totino´s Pizza Stuffers. On to the giveaway: Check out the new entry form I'm using below ~ it's from Rafflecopter & should make entering contests on my blog SO much easier. There is one mandatory entry and then several other ways to earn additional entries. : ) Good luck y'all! Disclosure: The information above, plus a prize pack for me, and one for my winner have been provided by Totino´s through MyBlogSpark. I can collect them to send to you. Being a home schooler doesn't count. We like the Totino's products for quick lunches and Hamburger Helper. I do not collect them. For the Totinos give away - Favorite product - Pillsbury ANYTHING...too many favorties to list them all.